The following commands will report the TCP/IP configuration — IPv4/IPv6 addresses and netmasks, routing table, and more — on Linux, Android, Apple OS X, Windows, and Cisco operating systems, plus the rest of the entire Unix family of operating systems. "Unix" includes anything vaguely Unix-like — Linux, Android, BSD, Tru64, Solaris, HP-UX, AIX, IRIX, etc., plus macOS. Many of these commands help you troubleshoot network problems. Just two more key presses gives you a clear explanation of what it's doing. More importantly, your typing errors become much more obvious! The GNU implementations of command shells including Bash, Tcsh, and others also support command and filename completion. These are what you have in Linux, Android, and OS X environments, and what you can have in commercial Unix environments once you add the appropriate GNU package. Be aware that the networking commands on Linux have gone through a major redesign! The traditional tools including ifconfig, netstat, route, and others may still be available and work as expected, but you may have only the Iproute2 project tools installed. With Android, for example, you get only the new Iproute2 versions. Both the traditional and the Iproute2 versions are explained here. Learn the new commands using ip. Also be aware that the move to systemd on Linux has changed the network interface names. You no longer have the traditional eth0, eth1, wlan0, and so on. from 33 to a smaller unused number such as 20. In base 16, 20 is 0x14. That virtual Ethernet device will appear at PCI bus address 00:14.0, and it will be enp0s20. Experiment: not all numbers will work, many will result in 16777736. PCI bus addresses may be used, an Ethernet device at PCI bus address 02:00.0 will be enp2s0. The Bus:Device.Function specification is in hexadecimal, PCI address 00:14.0 leads to enp0s20. Alternatively, as per this Fedora page, "... ports on PCI cards will be named p<slot_number>p<port_number>, corresponding to the chassis labels," so p3p1 or similar. If that fails, and it does in many situations, connect just one Ethernet interface to a switch. Then use ip link as shown below to see which one shows state UP. USB-connected devices will have names containing the PCI bus address of the USB controller, and the USB bus and device number. If the USB controller is at PCI bus address 00:03.0 (PCI bus 00, slot 03, function 0), and a wireless network interface is plugged into USB bus 1 as device 4, it will be wlp0s3f1u4. Finally, MAC addresses may be used: enx0011951E8EB6. AlphaServer DS10 and AlphaStation 200 4/233 running Linux and OpenBSD Unix. Here is an extra-short version with no explanations and no example output. Maybe all you need is a reminder! Add -a for "all" to also see interfaces that are present but not in use. Here is a Linux example, where the wireless connection has only been used a little, and the on-board Ethernet has not yet been brought up with an IP address. Use iw for link-layer work on wireless interfaces. Android on a Samsung Galaxy smart phone with the 802.11 wireless enabled. What a large number of interfaces! Linux has ethtool, I don't know of an equivalent in Android. The first example is for a virtual machine running on the Google Cloud Platform, so a virtualized Ethernet interface vtnet* and a nice 10Gbps LAN. See the example in the above section. ARP maps between IPv4 and MAC or hardware address. NDP maps between IPv6 and MAC or hardware address. It is based on a subset of the ICMPv6 protocol. In the above output, sis0 is the Ethernet interface. The first entry listed is for this host's Ethernet interface, the last is for this host's software lookback address. There should be no collisions on a switched LAN. If you do see collisions, suspect problems with the negotiation of speed and duplex mode. Some kernel modules (device drivers) may auto-negotiate by default, but then have an option to force auto-negotiation that causes slightly different behavior and results. Experiment! If there are significant numbers of errors other than collisions, suspect problems with the Ethernet cables (most likely) or possibly the system's Ethernet card or the switch port. To set the speed and duplex mode, you could run the appropriate ethtool or ifconfig media command immediately after booting, perhaps through /etc/rc.local. The problem is that the interface would have already come up in an inappropriate mode and networking would have to be restarted, especially if you are using DHCP. A better solution would be to load the kernel module with the appropriate optional parameter. On Linux, start by reading the kernel documentation for the driver-specific options. The kernel documentation is in /usr/src/linux/Documentation if you have installed the kernel source, or in /usr/sharc/doc/kernel-doc if you installed the kernel-doc package. Within whichever one is relevant, find the subdirectory networking, and within that, a file with the same name as the driver. If that doesn't provide the needed information, you will need to look at the source code. Start at /usr/src/linux, go down to drivers/net/ethernet, to the appropriate manufacturer-specific subdirectory, and look for the appropriate file. Once you find the appropriate parameters, you can specify them as option lines in /etc/modprobe.d/ethernet.conf. An option is the modify the boot script configuration file used to start the network service. Cisco Catalyst 2900 XL switch. Linux with two wired Ethernet interfaces and one wireless LAN interface. Android on a Samsung Galaxy smart phone with the 802.11 wireless enabled. Notice that only interfaces #1, #11, #21, and #22 have IP adddresses assigned. The IPv6 routing table prints much wider, as there is enough room in the "Destination" and "Next Hop" columns for a full IPv6 address. One line is listed for each IPv6 neighbor on the network, the neighbor's IPv6 address/128 as the destination and its IPv6 address as the next hop. See the page "How Routing Works" for an explanation of IP routing and example output. On Linux and BSD, you can assign an IP address and netmask interactively. You will need to know the correct device name, but ifconfig -a or ip addr will show you the list. Use the LAN oriented commands above if you need to figure out which of two Ethernet interfaces you're using. Use ifconfig on traditional Linux and BSD, ip on Linux with Iproute2. ## miscalculate the broadcast address! ## contradictory, strange problems will occur! ## Ethernet card, your networking will mysteriously fail. For channel bonding, configure a bond interface in ifcfg-bondN and then configure network interfaces to be bound together. Here we bind p3p1 and p7p1 to be bond0 and configure its IP. The bonding options specify MII link monitoring at 100 millisecond interval and Active Load Balancing policy for fault tolerance and load balancing, with transmit and receive load balancing for IPv4. For more details on IPv6, 802.11i/WPA2 security and more, see my page on on networking with the Raspberry Pi and its Debian/Ubuntu derived distribution. You will then be asked to enter the target IP address. The output will resemble something like the following, with one line per router along the way, and three probes to each router. The tool works by sending packets with a TTL or Time-To-Live of just one hop. The first router they reach is obligated to drop those packets, and we expect it to send back an ICMP packet reporting this. The tool does the timing and tries to look up a domain name corresponding to the router reporting the errors. Then it repeats the process with a TTL of 2 hops, then 3, increasing until it receives a reply from the target, or the TTL reaches 30 hops, more than enough to get to the other side of the world. Note that many web servers today silently drop traceroute probes. In that case you will see the trace to the last router and dropped packets (stars) beyond that. Use tcptraceroute to trace the route for a specific TCP port. Also remember that most organizations pay a company to host their web server at an entirely different point in the Internet topology than their main operation. And, with CDN or Content Delivery Network operations like Akamai, prominent web sites are frequently hosted on several mirrors all around the world and you will be directed to the closest one. Here is an example. I was staying at a hostel in Fukuoka, Japan, when I updated this page. I asked for a trace to the Purdue Federal Credit Union in Indiana. I explicitly asked for the IP addresses to be converted back to fully-qualified domain names. Depending on your version of the tool, it may provide nothing but IP addresses by default. This example shows some of the potential DNS oddities. The name www.purduefed.com is an alias, the canonical name is simply purduefed.com. Then, the hosting company has not changed the PTR record mapping back from IP address to name. It used to do business as Purdue Employees Federal Credit Union, using the domain purdueefcu.com. Hop #1 is the wireless access point in the hostel. Hops #5 and 6 are routers in the 202.213.194.0/24 network. That network also belongs to so-net.ne.jp, but they have not set up pointer records and we only see IP addresses, not names. You can look up address ownership with the whois command. Hop #9 timed out all three times. That router dropped the timed-out packets, but it did not return ICMP error reports for that. Later steps returned results, so this router was not responding as expected although it could successfully forward packets. Use ping6 and traceroute6 to test connectivity over IPv6. Most operating systems implement traceroute and traceroute6 correctly, sending packets to a randomly chosen UDP port. They expect the target to reply with an ICMP error reporting that no service is using that port. The Windows version, tracert, inappropriately sends ICMP packets. Routers aren't supposed to report ICMP timeouts with more ICMP packets, as that could turn into an endless feedback loop. But with so many people using Windows, many routers make an exception. Many, but not all. If you use tracert on Windows, you may get less information. Rack of Cisco routers. 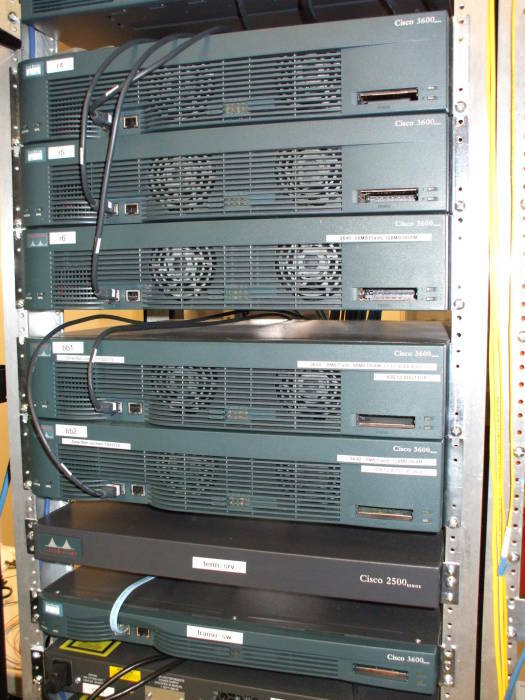 Most are 3600 series routers, the brown one near the bottom is a 2500 series. 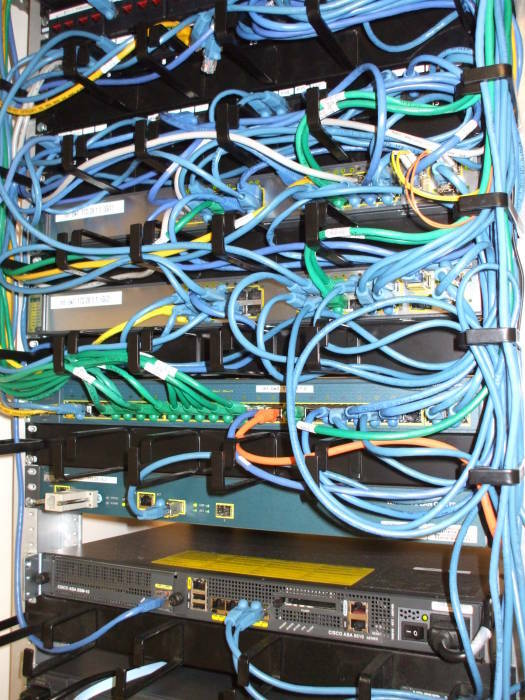 The network connections are on the opposite side, the single cable to each router is a connection to its console port. Click here to see several detailed examples of netstat -a output and the corresponding Cisco output. Note — check the manual page for your version of netstat to find the option to only show TCP/IP and leave out the possibly voluminous Linux/Unix domain socket information. It's probably -f inet or -A inet, and -f inet6 or -A inet6 if you're running IPv6. Use tcptraceroute to test TCP connectivity. Click here to see several detailed examples of netstat -s output and the corresponding Cisco output.